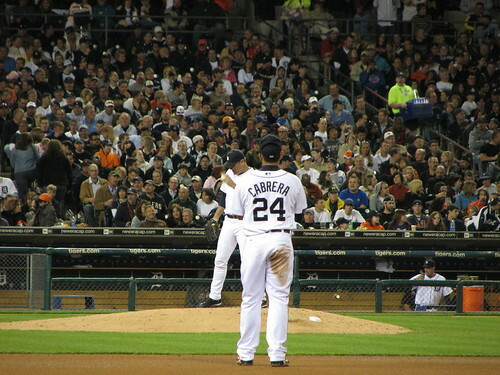 Cabrera vs Gonzalez: Peter Abraham's Made His Choice, Have You? Miguel Cabrera, originally uploaded by Kevin.Ward. True, he came over from a Yankees blog and seems to fall back into that beat from time to time, but I generally like the work that Peter Abraham is doing for the Globe thus far. Which is why his latest piece “Miguel Cabrera? No, thanks” surprised me. It’s not that I think Cabrera’s a no brainer trade target for the Sox; the .26 BAC on the last weekend of the season was bad, the resulting domestic incident with his wife horrifying. But Abraham’s case against Cabrera, otherwise, seems weak to me. Why doesn’t Cabrera belong in the same sentence as Adrian Gonzalez, exactly? Offensively, they’re very comparable. Gonzalez’ 2009 line was .277/.407/.551, Cabrera .324/.396/.547. And before you point to Petco’s BPF of 89, remember that Cabrera’s playing in essentially a neutral park (six year average is 100.16) in the American League, against American League pitching. More, James’ projections show Cabrera being the obviously superior option next year: .318/.394/.569 to Gonzalez’ .279/.372/.516. Oh, and unlike Gonzalez (.770 OPS vs LHP in 2009), he shows essentially no platoon split: .315/.441/.517 vs LHP, .327/.380/.556 vs RHP. Also? Cabrera’s a year younger than Gonzalez and 72 career home runs up on his older rival (209-137). Not that this is a surprise: in his six full seasons in the majors, Cabrera’s put up wOBA’s over .400 three times, and just missed in a fourth season (2005, .399). Gonzalez, meanwhile, only has four full seasons to his credit, and has exceeded a .400 wOBA just once, last season. If anything, then, Cabrera is Gonzalez’ offensive superior due to the fact that he’s done it for longer, and is more or less equally effective against left and right handed pitching. Yeah, but the defense, you’re thinking. Cabrera’s eating his way out of a position. Well, maybe he is, and maybe he’s not: I don’t have data on that. But Gonzalez’ edge here isn’t as big as you’d think. In 2009, Gonzalez put up a strong UZR/150 of 3.4. Cabrera? 3.1. And remember, this was just his second season at the position after moving over from third (where he was, it must be said, pretty brutal). True (add in the 2015 figure of $22M). Gonzalez, meanwhile, is owed a mere $4.75M, not including an eminently affordable 2011 $5.5M option. But if the Sox are going to heavily mortgage the farm for Gonzalez, you have to assume they’d like to extend him beyond 2011. And what do you imagine that cost might look like? Fangraphs says Gonzalez’ 2009 season was worth $28.4M. What do you think Gonzalez’ is going to ask for should he hit free agency? I don’t know, and neither do you. But that’s the point: you don’t have to wonder with Cabrera, you know. Cost certainty is not the primary concern when the total obligation is north of 100 million, but neither is it valueless. Maybe. But just because Ilitch has money doesn’t mean that he wants to spend it frivolously on a club that may or may not contend (seriously, look at their roster), and is saddled with expensive and unmovable obligations like Ordonez. Nor does it mean that retaining Cabrera represents the quickest route back to the playoffs for the Tigers; indeed, the best option for them may well be to move Cabrera for the talent he would undoubtedly command in return. He’s a premium offensive player locked up for years at a contract that looks to be market appropriate, and would bring a substantial return even with his market limited by the contract size. Gonzalez, by comparison, is eminently movable with his currently affordable contract. Meaning that the Padres addressable market is wider, and thus more competitive, at least in theory, than it would be for Cabrera. Anyway, do I really want Cabrera? Not without some assurances that he’s addressing his drinking problems, no. But neither do I think it makes sense to write him off based on superficial observations, particularly relative to a player who is provably his inferior.